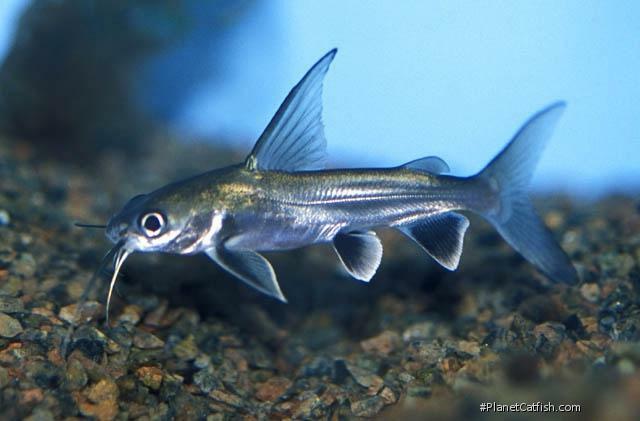 Another fish whose taxonomical background is somewhat difficult to fathom; our Shark Catfish is often referred to as Arius jordani and has been moved to the genus Hexanematichthys but currently resides in Ariposis. The family Ariidae is distinct in the catfish world as being the only family to have a truly global distribution. They can be found on all five continents from marine environments (hence the family's rather general tag of "Sea cats") to freshwater lakes, they are however all tropical. I think these are great catfishes for the aquarist seeking to keep big fish without having to build an indoor pond. This catfish is easy to rear to an adult size of around 12" or more. A small shoal can be maintained in a large, at least 2 foot wide aquarium. By the time they reach this size however, these fish will require to be kept in brackish water and so at this stage your choice of tankmates is restricted. Conversely if you've always wanted to keep shoals of Scats or Monos then this is THE catfish for you! It must be pointed out that this fish does lose some of its striking colouration as it grows; the black white-edged fins do grey with age. But for a big catfish, the shark cat is very active, which is a good feature. When larger these fish are very tame and will eat from your hand if properly trained. Watch out for periodic "mad" spells from these fish (I lost a Shark cat that was extremey active for a number of days and eventually swam at full speed into a glass stress bar at the top of the aquarium), perhaps this can be attributed to their natural migratory nature? Size 350mm or 13.8" SL. Find near, nearer or same sized spp. Identification ID based on adult specimens, the young fish appear regularly in the hobby and various species (from coastal Peru and Brazil) may be available. The differences between many of the genus are slight at an early age. Sexing Immature at under 200mm length, female has lighter fins in adult fish. Distribution Pacific rivers from Southern California down to Colombia. Other Parameters Salt should be added in relation to the age of the fish. The older the fish, the more salt, right up to 100% marine. The fish is very tolerant of changes of salinity and will live in freshwater happily as a young fish. Feeding A true omnivore, these fish are often near starvation when bought at the smaller than 2" size but can be brought on very successfully on frozen bloodworm. Once acclimatized, feed less protein rich foods such as catfish tablets. The fish can be trained to approach the surface to feed. Adults can be fed frozen prawns intermittently. Furniture Large, open spaces not too brightly lit, this fish is an active shoaler although initially youngsters are quite shy if not given plenty of plant cover. Rocks and or wood are unnecessary. Compatibility Very similar to South American Pimelodids, keep with fish that like similar water conditions and are big enough to prevent being considered prey. Youngsters (smaller than 12cm) can be kept in alkaline fresh water (with for example rift lake cichlids), but larger fish MUST have salt added to the water in order to thrive. Suggested Tankmates Initially most medium sized active fish, but with the addition of salt to the water as the fish grow, brackish water fish such as Monos, Scats or large Mollies are the order of the day. Breeding A mouthbrooder, the few, amazingly large eggs are incubated by the male. Reproduction in the aquarium is difficult as the aquarist requires to emulate the migration from marine to fresh water and back again in a spacious aquarium. The is one verbal report of this being accomplished by an American aquarist who spawned the fish by gradually changed the water from marine to fresh water and back again over a 12 month period. References Catalogue of the fishes in the British Museum v. 5, pp 147, Fig. There are 33 registered keepers, view all "my cats" data.